I have a funny little plum tree in my garden. It resides in a large faux-terracotta pot and has moved from house-to-house with me for the past 15 years. Bearing the scars of traversing the city in trailers and removalist trucks, it now lives on a permanent lean. The trunk is narrow; the branches spindly. The foliage often turns yellow and drops by the second week of summer - this tree has all the hallmarks of a bit of Hoppo Bumpo neglect horticulture. 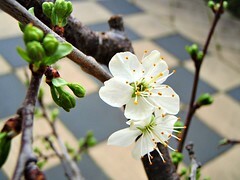 Yet, in spite of its harsh life, the little tree blossoms every year. Its a pretty, fluttery blossom, full of promise. And every year I wait ever so hopefully to see what happens next: fruit, or not? There was great excitement this year - apparently we were in for a bountiful harvest. In an uncharacteristic move, I spent time in the winter and spring pruning, feeding and mulching. 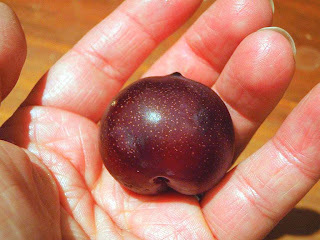 And so it was that we harvested 7 plums. By crikey, what to do with the bounty? Thank goodness a dear friend passed on an excellent recipe that calls for quite a lot of plums ( ... oh, and that I stumbled across a 5kg box of beautiful, juicy plums at the market for $2.oo). 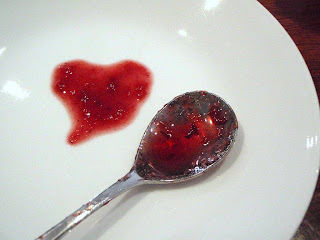 We feasted at Christmas with the most delicious plum sauce. Try this super easy and rewarding recipe if you get the chance. And please, don't bother with trying to grow the plums first. That bit is not rewarding at all. Boil all the ingredients together for about 1.5 hours. Bring to the boil for 10 minutes to sterilise the jars. Carefully remove the jars and lids and place straight onto a baking tray lined with a clean tea towel. Place in a preheated oven at 110°C (230°F) for 15 minutes. Strain the sauce to remove the plum stones and skin. Remove the jars from the oven and pour the sauce straight into the hot jars. Put the lids on tightly and turn the jars upside-down for 10 minutes. Turn the jars back the right way up and cool. A vacuum seal should have formed on the lid and the little "button" in the middle should have been sucked down. My jam stirring arm was getting itchy, so I went on a tour of all our plum trees yesterday only to find that our bounty is not going to be much bigger than yours. Oh well, the blackberries are looking good. Wanted to stop in and say...you're famous! Well, at least I think so. I recieved a Sewing Calendar for Christmas...and you're in it! Yea! Yum yum! Bugger about the plums. We've just harvested the (most massive_ crop of 47 (!) little nectarines from our poor old tree. Luckily they are all delicious, even if they are insect ridden and curly-leaf infected. Also - I've been busy using your fabric! The photos is awful, but I hope it makes you proud. BTW - I love it. Love love love it. i'm on the lookout for cheap plums now. yummo.